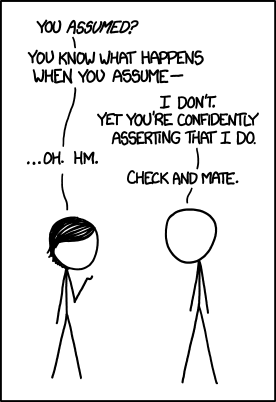 When you assume… – Hey! That’s My Hummus! … you make an overstated cliche that everyone already knows. This week we take a break from the usual review of current events with our commentary sprinkled in — and we talk about ourselves. There is far more to each of us than “Jewish, male podcast host” and “Muslim female podcast host.” Those around us have made assumptions about who we are, what we stand for, and how we think. But as multi-faceted individuals, sometimes they don’t get it right. Each of us took five points which we feel people have assumed incorrectly about us. What assumptions do people make about you that are not true? Written by: shiny on March 11, 2016.